I'm hoping to find out about the origin of the clear glass jar on the left in this photo, not the milk glass jar on the right. It's not from the island. I think someone bought it to use as a comparison with the glued-together pieces which WERE found on Niku (in the center of the photograph). I don't have any handy summary of the work of the glass-and-bottle group from EPAC. Joe Cerniglia is a very active researcher, and there are a couple of other expert collectors involved, too. They almost certainly said something about the clear glass jar with the blue top on the EPAC mailing list at some time or other, but, regrettably, I don't remember what they said. I do have a very dim recollection, which may be utterly inaccurate, of someone talking about ink jars. It seems to me that all of the fountain pen ink that I have ever had came in clear glass jars. I have no idea what kind of pens, if any, AE and FN would have carried and used on the flight. I do believe that if they landed on Niku, AE would carry some kind of notebook and writing instrument with her. A survivor's journal would be worth the investment in time and energy, if they survived the adventure. This speculation is pretty much unencumbered by any attachment to facts. "...I think someone bought it to use as a comparison with the glued-together pieces which WERE found on Niku..."
"...I do have a very dim recollection, which may be utterly inaccurate, of someone talking about ink jars." Many thanks Marty for this info. Can we find out from Ric or Joe Cerniglia who brought the clear jar to the symposium, and where they found it? "They almost certainly said something about the clear glass jar with the blue top on the EPAC mailing list at some time or other, but, regrettably, I don't remember what they said." Can we can learn more about what was disscussed by the EPAC? An interesting notion. I've never seen ink packaged in jars with wide mouths such as our found artifact. Although I have seen quite a few large volume ink jars (indeed, I've several here on the shelf), they all have had smaller necks and mouths. Would think smaller necked jars would make it easier to refill from. However, all of that being said, I would think it would be simple enough to inquire with the larger such companies of the era (Shaeffer, Parker, Omas, Pelikan, Quink?, Waterman, etc.) to see if they've packaged in a similar jar. Most are still in business today to one extent or another. "Hi! It's Joe Cerniglia. We met at the Earhart 75 Symposium. A question has arisen on the forum as to who found and purchased the clear jar for use in the artifact exhibit. http://tighar.org/smf/index.php/topic,261.60.html. I was the one who came up with that one. I found it on Ebay, about a week before the Symposium. Having been the one who originally brought the freckle ointment to EPAC's attention, I've been hot on the trail for this one...and I'm not letting up! Also, you might want to know that I've sent a piece of the artifact jar to a lab in Syracuse, and we're expecting the results any day now. We're trying to determine if trace mercury can be found embedded in the glass that would perhaps signal freckle cream. It's a long shot, and negative results would prove nothing either way, but it's obviously a test worth doing. I'm ably assisted by the advice and counsel of Dr. Tom King, Tighar's Senior Archaeologist and a scientist named Greg George, who works at Sherry labs in Oklahoma. Greg and I met, oddly enough, through a comment he posted to an article in Discovery about the freckle cream". Joe goes on to say that he can answer any questions to all of you on this matter at joecernigila@hotmail.com. From Joe to you..."Thanks and Best regards to all of you on the forum...I read all of your posts each day and wouldn't missed it! I've never seen ink packaged in jars with wide mouths such as our found artifact. Me, neither, now that I think of it. None of the three jars of ink I have here at home have mouths wider than the base. I guess the ink idea stinks. I was thinking more on this idea last night. Now that I do spend more time on it, I also notice that every ink jar I have...or recall ever having or having seen....also had a plastic or bakelite cap/lid on it. Our artifact would have had a metal lid. I suspect that this is significant as ink would likely have an adverse chemical reaction from being exposed to metal over a prolonged period of time. Although I thought the ink pot notion might have had merit.....now I'd say you were right. It 'stinks'! Now that I do spend more time on it, I also notice that every ink jar I have...or recall ever having or having seen....also had a plastic or bakelite cap/lid on it. I have a bottle of black Schaeffer ink with a metal lid on it. It is probably not more than 22 years old. I much prefer plastic lids, FWIW. 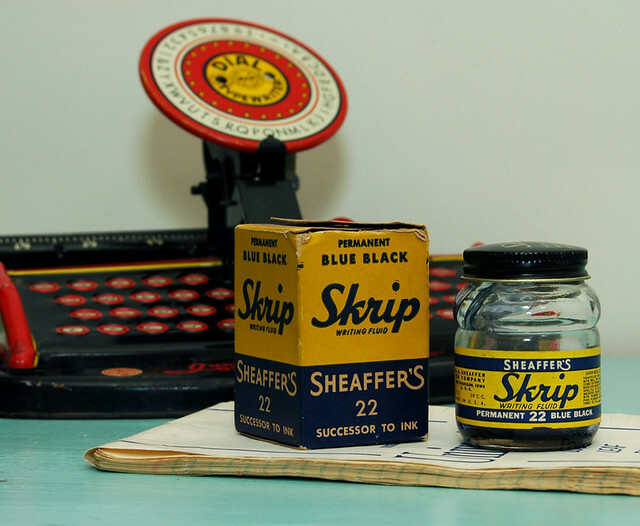 I found this picture of a Scheaffer ink container with a metal screwcap. The box and its markings, especially, conjure up strong memories from my elementary school years (early 1950s), when I would experiment with filling my mother's fountain pen when I was home alone. I found this picture of a Scheffer ink container with a metal screwcap. The ink bottle is identical to the one I have. The built-in inkwell is handy. My label is much smaller and simpler. Aaack! I have, in the past, had a couple of those particular bottles of Schaeffer's. Had forgotten about them. Hmmm...perhaps ink is not as reactive as I had presumed. I still cling to my comment about the mouth size of the bottles, however. A quick image search on Google seems to bear it out. There are a few with slightly wider than average mouths...but none on the scale of our artifact. 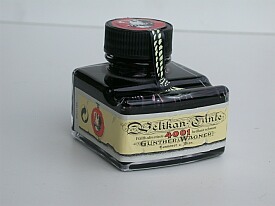 I always rather liked the Pelikan ink bottle with the built-in pen holder. But....actually preferred Omas or Visconti ink. You're right Marty, the plastic lids were nicer. Metal seemed to make it feel a cheaper product. Very impressive ink bottle. I have never seen one like it. The artifact seems rather over engineered to be an ink pot? Why the thickness of glass? If you are churning out and shipping tens of thousands or more a week wouldn't the cost and weight of the container be minimal compared to its contents, ink. Why the fancy shape? a less aesthetic shape would be cheaper to produce. It looks as though it was designed to catch the eye first, missing fancy label? contents were secondary. Ink is ink, bought with cost in mind, I buy dozens of printer cartridges by cost, stuff the box and packaging! Richie....Don't know if you've seen this box or not...but did read the article and was quite amazed by your finding. Anyway, so this box we have is rather quite interesting! Anyway, here are two pics for you to analyze! Thanks!! !